It’s already that time of year again…VIP Gala tickets are on sale as of today! This kickoff party will begin our favorite weekend celebrating handmade goods. If you’ve never been before, here are a few things you need to know that make the VIP Gala special:Lighter crowds: The opening night is your best chance to get to know the artists and get first dibs on their work. We sell a limited number of VIP tickets to make that evening special and allow ticket holders to avoid the crowds of Saturday and Sunday. 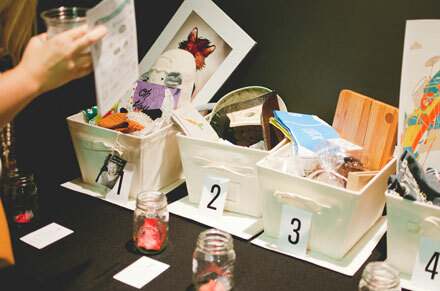 Giveaways: Our artists always go above and beyond in donating work to our giveaway baskets. We usually have 12-15 baskets worth over $100 each. Each basket will find their way home with a VIP ticket holder. Free Food and Drink: Catered this year by Chef Peter and his team at Chef 360 Catering, the food is going to be out of this world. And in keeping with the theme of buying fine local craft products, we’ll be serving locally produced beverages including coffee from Greenville's newest coffee shop, Methodical Coffee, house blended teas and lemonade from Tealoha, and a selection of South Carolina made beers and ciders. Live Music: And to top it all off, there's live music! This year we're excited to have local band Pioneer Fires playing for us during the VIP event. Their sound will be the perfect backdrop to the party. You won’t want to miss it! The 2014 VIP Gala will be held on Friday, September 12 from 6 to 9 pm at the Huguenot Mill in downtown Greenville, SC. This ticketed event kicks off the festival weekend, and helps support our artists and the mission of Indie Craft Parade. Check out the full details on our website and get your tickets here! This is it! Sunday, June 22 at midnight EST is your last chance to apply for this year's Indie Craft Parade. We do not consider late or incomplete applications, so if you've started an application but haven't finished yet, this weekend is your last opportunity to finish and submit! For those who aren't applying, but know an artist who should submit their work, we've made it easy for you to send out an email introduction to Indie Craft Parade. Help us find the best handmade goods in the South! It's the National Day of Making! Hello Crafters, Creators, and Makers of all kind, and Happy National Day of Making! We love that in the past few years more and more Americans are looking to their neighbors and friends as well as local/regional sources to buy things that they used to purchase from faceless corporations. It's exciting to watch people actually discover where their goods come from--whether that's forming a relationship with a farmer or small grocer, buying handmade decorations and accessories, or searching for local businesses to accomplish a task or need. All across the country and even across the globe, people want to buy from other specific people. We're also very proud that Indie Craft Parade has helped facilitate some of these changes in our own area. Every time we host the Festival or The Makers Summit, we see new artists taking the next step to increase what they make, and we see new people in the community hungry to buy from them. So in this spirit of celebrating making, we join Maker Faire in spreading the word about this day dedicated to making. For those of you unfamiliar with Maker Faire, a brief explanation: Part science fair, part county fair, and part something entirely new, Maker Faire is an all-ages gathering of tech enthusiasts, crafters, educators, tinkerers, hobbyists, engineers, science clubs, authors, artists, students, and commercial exhibitors. All of these “makers” come to Maker Faire to show what they have made and to share what they have learned. Maker Faire hosts events all across the country to support individuals and businesses using their creativity. While the scope of Maker Faire is much broader than Indie Craft Parade, many of our objectives are the same. Chiefly...promoting making, and everyone who's doing it. Maker Faire's impact has become so extensive that it even caught the attention of the President. Today the White House itself is hosting its first ever Maker Faire (as explained by OK GO in this video). So spend part of your day celebrating making. If you're an artist or crafter, show the world what you're working on. If you know makers who should be celebrated, tag them in your social media posts. And be sure to watch all of the action of the Maker Faire at the White House today. Follow #NationOfMakers on Twitter and Facebook. Oh, and of course, tag Indie Craft Parade on Instagram when you post photos what you're making. P.S. If you're curious which makers we're loving right now, check out our newly added Etsy page. Celebrate making! Celebrate handmade! The long wait is over! Applications for Indie Craft Parade are now open. Put together your best product photos and send them our way through our online application. We can't wait to see who all comes in this year! If you're not a maker but you know someone who is (and who you think should be a part of our festival), tell them to apply. We've made it easier than ever to recommend applying to Indie Craft Parade. Check out this automatic message here, and send it to your crafty friends. Thanks to all our friends and supporters who attend each festival. We'll see you in 103 days! 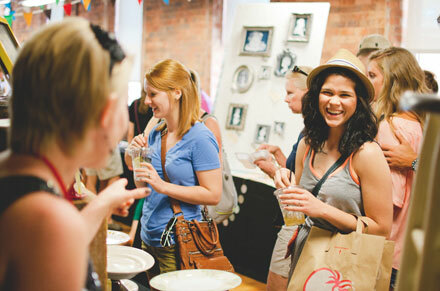 Since our first show in 2010, Indie Craft Parade has been dedicated to showcasing the best handmade goods in the South. We believe in supporting the creative renaissance in our region. We love that makers like those who exhibit at Indie Craft Parade are reinventing Southern culture and putting us on the map as a creative hub. There are many amazing shows that cater to artists from all over the nation, so for that reason we are currently limiting applications to Southern makers only. This model not only encourages festival attendees to buy local, but also introduces them to artists with whom they can build ongoing relationships. The festival is open to makers from all Southern states, as defined by the US Census. This formal definition of the South includes 17 states along historic and geographic boundaries. If you are a potential Indie Craft Parade artist living in one of these South or if you know of great artists in these states, please apply! We always enjoy seeing new work and meeting more of our Southern makers. Applications always open June 1. Although the festival is limited to Southern makers at this time, we wholeheartedly love creatives from everywhere, and that's why we created Makers Summit. Our next event is coming up very soon, and if you've ever wanted to learn more about bookbinding, this is your chance! Cindy Leaders, an Indie Craft Parade alumnus and talented bookmaker will teach us how to create books using reclaimed materials. And what better place to learn about making books than at the library? Join us at the Downtown Hughes Main Library in Greenville and learn how to make Buttonhole Pocket Books, a simple bookbinding technique that is easy to recreate at home. These little books would be perfect for sketching, journaling or even giving as a gift. Cindy Leaders, with some of her Useful Books. Students should bring a pair of needle nosed pliers (curved are preferable). Additional materials and tools will be provided to make three 3” x 4” books. All skill levels are welcome. Entering The Makers Summit by goinghometoroost. The main conference hall by bofagram. The business card guestbook by french_ashley. Vagabond Barista's pour over bar by theflyformal. 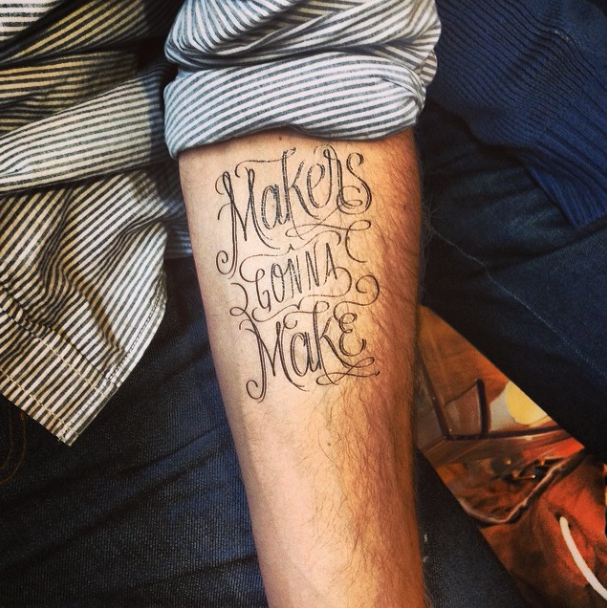 Makers Gonna Make Tattly by tjbreil. Jude Landry's keynote by indiecraftparade. Just before dinner by lilyasher. Menu shot by our presenting sponsor virb. Party Lounge during The Best Craft Party Ever by michelle_smth. Goods from all the party stations by onceagainsam. If you're still in need of a last minute gift idea for the creative person in your life, we might be able to help! 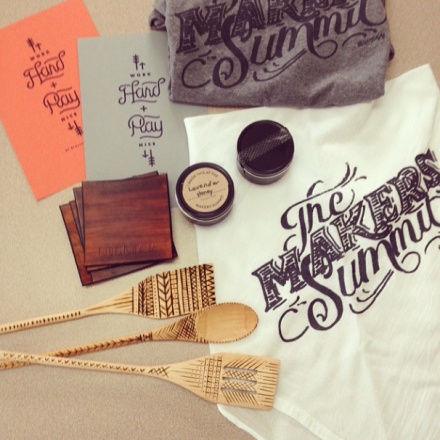 Reserve a ticket for The Makers Summit or The Best Craft Party Ever (or both!) in time to give for Christmas. The conference takes place Saturday March 1, 2014 from 9am - 5pm. Tickets include a light breakfast, lunch, keynote sessions, panel discussions, and one-on-one sessions with experts. The day is designed to connect fellow creatives while learning how to start or grow your creative business. While the conference is geared toward creative entrepreneurs, the after party is open to anyone who loves great food, and making alongside others. The goal here is to simply celebrate the fun of making and meeting other makers. Learn more here. · An all-access pass for both the conference and after party for $150. · The conference day pass for $100. · The Best Craft Party Ever evening pass for $50. Reserve your gift ticket this week! This is always such an exciting time of year! Every November get to share some much needed funds with a Greenville County school's art department. If this is the first you're hearing of our school scholarship program, let me give you a brief recap. 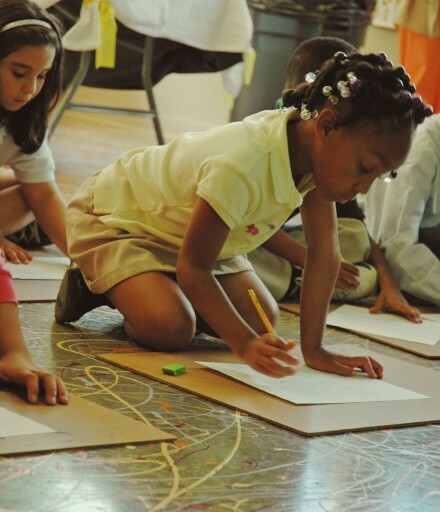 For the past 3 years, we've awarded a $500 scholarship to a local school who demonstrates both a need in their art program and a clear plan for the funds. Every year there are so many good applicants. Reading through the numerous applications, we were again reminded of the great need in all of our schools to improve art resources. Yet we are also so humbled and amazed to know how much the teachers are able to accomplish on limited budgets. We certainly wish we could award everyone the scholarship funds. They all deserve it. That being said, we are pleased to announce that the recipient of this year’s scholarship funding is St. Anthony of Padua School. This school largely serves the impoverished neighborhood surrounding the school in West Greenville. 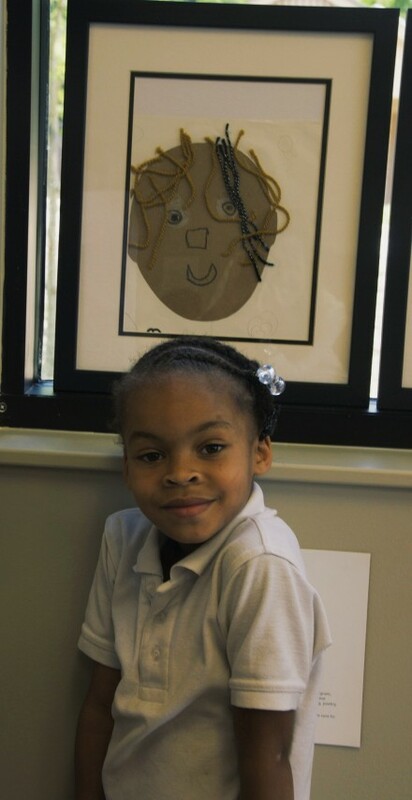 In addition to creating an art program for the students who attend St. Anthony's, the art teacher, Catherine Pate, has created an after school program to further student's art techniques and imaginative skills. We're so happy to be partnering with this school. We're already discussing fun plans for artists demonstrations and ways to help the kids who attend St. Anthony's learn to love the arts. If your school or a school you know of would like to participate in our scholarship program, please stay tuned. Applications are open every year in September and October. We want to know of the needs in Greenville, and we rely on you to tell us. 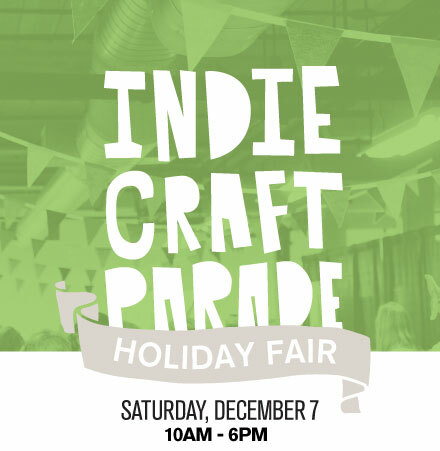 It's hard to believe that it's already time to think about Christmas gifts, but we're less than a month away from our Indie Craft Parade Holiday Fair! Mark your calendar for this one-day event on Saturday, December 7th in The Village. Once again, it will be a neighborhood affair, with open studios, food trucks and much more! Our Holiday Fair will be in a brand new space, with room for over 30 previous Indie Craft Parade participants. 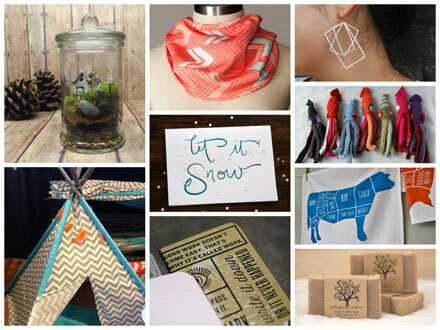 See a sneak peek of their handmade goods below and keep reading for a full list of artists. When Lisa Congdon wrote "My Art was Stolen for Profit" earlier this week, we were outraged on her behalf. Several pieces of Lisa's art were reproduced without her permission by the wholesale supplier Cody Foster. Lisa is not only pursuing legal action, but she publicly called out Cody Foster and has garnered a good deal of support in her efforts to share the story. In every industry there are knock offs, but the craft world seems to be especially plagued by this phenomenon. Whether it's an artist creating work that's uncomfortably close to another artist's or DIY tutorials about how to make something just like what so-and-so sells, the disrespect for creativity is the same. In this instance, Cody Foster regularly purchases items from independent artists and then resells a mass-produced version of the item to retailers. The revelation that Cody Foster has done this for years is maddening, and yesterday it got even more personal for us. Sarah Mandell of Once Again Sam shares our hometown of Greenville and is an Indie Craft Parade alumni. 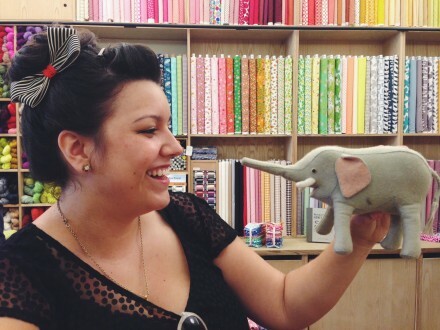 Her felted curiosities are playful, unique, and take hours to create. This year, Cody Foster is selling owl ornaments almost identical to the needle-felted owls Sarah has been selling for the past three years at our events and many others across the Southeast. Today, we are officially joining Lisa's cry to spread the word and stand up for independent artists. Let your local retail shops know that Cody Foster has made a habit (and a business) of ripping off artists, most of whom can not pursue any kind of legal action. Write an email to retailers you frequent, or if you're a shop owner and have access to the Atlanta Market, stop by Cody Foster's booth in person and politely let them know your purchasing dollars will be spent with companies who respect artists. Fast Company states it well in their article: "A wholesale company like Cody Foster might not fear lawsuits, but it can be imperiled when consumers start telling their friends and complaining to the big companies that buy from wholesalers." We were thrilled to see retailers like West Elm and Fab drop Cody Foster wares in a show of support for artists, but there is still plenty we can do. Indie Craft Parade has reached out to our retail contacts about Cody Foster and we encourage you to do the same. Lisa's post, among other revelations in the past few weeks, has confirmed in our mind the importance of education when it comes to ethical choices in the craft world. As a result, we will be including this topic in our 2014 Makers Summit lineup, addressing issues like inspiration versus copying. Plagiarism isn't tolerated in the academic world, and we don't think there's any reason the line should be blurred in the art realm. This past weekend, we hosted the first of our 2013-2014 event series, a DIY PR workshop with Amy Flurry. We met Amy at last year's Makers Summit and it didn't take us long to realize that artists and small business owners need to hear what she has to say. We were excited to bring her back to Greenville for this event. Amy wrote a book called Recipe for Press and gave our group insight into how to think like an editor, sharing habits of people who get press. She also introduced a very cool tool called the Pitch Wheel to help keep track of when to send material to editors who are typically planning content months ahead. One of our favorite quotes from Amy's workshop: "If you only pitch, but don't follow up, you've only done half the job." Be sure to like the Recipe for Press Facebook page for more tips from Amy and check out the next few events in our lineup so you don't miss any of these great educational opportunities. 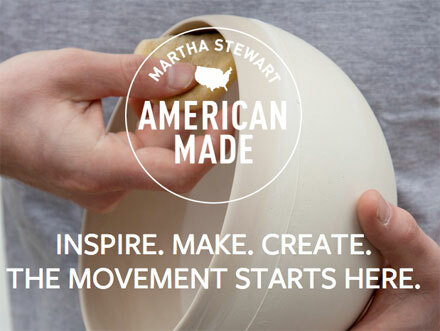 As fans of handcrafted goods, we love what the Martha Stewart American Made awards are doing for makers across our nation. Showcasing handmade in the areas of food, craft, design, style, technology, and garden, this initiative gives you the chance to cast six votes each day for your favorite American Makers. Audience Choice voting has been extended until September 22nd and we're so proud of how many Indie Craft Parade alumni have been nominated! The six nominees with the most votes in their categories will move on to the final round of voting for the Grand Prize, which is $10,000 to further their business, a trip for two to New York City to attend the American Made Workshop, and a feature on marthastewart.com! This is an amazing opportunity for our artists and their businesses, so please be sure to vote every day and let your friends know to do the same! Check out the Indie Craft alumni nominees below. You can click on their image to be taken to their page to vote! Remember, vote for your favorite American Made nominee between now and September 22, 2013! Another fun perk: Each vote enters you into a weekly drawing to win a book signed by Martha Stewart, American Express gift cards, or other great prizes. 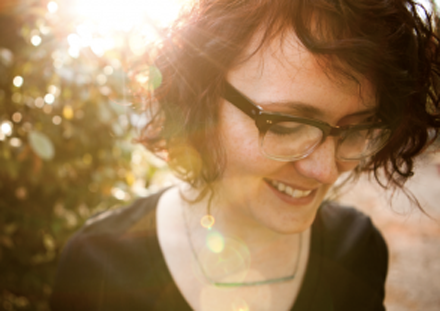 Introducing The Indie Craft Parade Year of Workshops/Partnering with Amy Flurry. Anyone who has followed Indie Craft Parade for even a short amount of time knows that we have two main objectives: 1) bring handmade awareness to our community and 2) assist artists and creatives in growing their businesses. Well, we're super excited to announce that over the next year we have even bigger and better plans to make that happen. Of course, we'll be again hosting The Makers Summit and the Holiday Fair. But additionally we will be having once-a-month workshops or meet-ups to further encourage either hand-making or small creative business success. We've planned an assortment of events where attendees could learn a new skill they've always wanted to try, further connect with other makers in our community, and develop valuable tools for growing their trades. The full details of these events will be available at the festival in a few weeks. However, we wanted to introduce our first workshop right away. It's an extremely valuable tool, and we want as many people to know about it as possible. On October 5, we will be partnering with Amy Flurry, the genius behind Recipe for Press, to hold a Saturday mini-conference. How do you find the right editor to approach? What are they really looking for? How far in advance should you pitch a magazine? How long should you wait before following up? What one word is an editor looking to find in every pitch? How long should a pitch be? Do you need a press kit? Can you pitch an idea to multiple editors at the same time? Should images be sent with a pitch? How often can you pitch a blogger? Should you give away tons of products? What is the best way to thank an editor? What do editors need to find on your website? How many editors should you approach at one publication? What kind of approach gets results? Amy speaking at the 2013 Makers Summit. There really is no one better to be addressing this topic than Amy. Besides her own book, Recipe for Press, Amy has contributed to magazines and online publications including Lucky, InStyle, O @ Home, Country Living, Condé Nast Traveler, Better Homes & Gardens, House Beautiful, Budget Living, Design Sponge, and Refinery 29. And she's willing to share what's she's learned through the process with you. Please contact us at info@indiecraftparade.com if you have questions about this event. We can't stress enough how important this workshop could be for your business. One of our favorite industry heros is Grace Kang, founder of Pink Olive and Olive Box. Grace is a seasoned retail expert, formerly a buyer for Bloomingdale's, Saks, and Barney's, and now successfully operating her own Pink Olive stores. She was one of our keynote speakers for the first Makers Summit, and gave an informative and inspiring talk on how independent artists can get their products in retail stores and challenged them to "make it happen!" 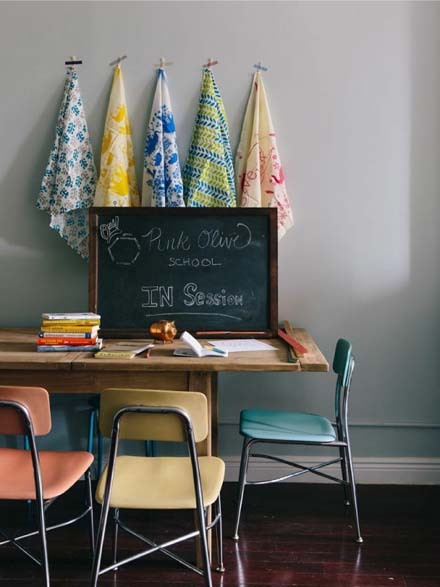 We're thrilled to announce the launch of Grace's newest project, Pink Olive School! Pink Olive School is an expansion of Grace's business coaching service, previously known as Retail Recipes. It's a one-on-one mentorship designed to help independent makers take their creative passion into a sustainable business. Grace will help participants lay the fundamental groundwork for running a business, build a desirable and cohesive brand, pitch to retail buyers, price products and create a linesheet, and even share her industry contacts and referrals. No matter how passionate you are, "you can't change what you don't know." We are so glad that Grace is willing to share her knowledge and expertise with independent artisans; she shares our passion for supporting and empowering the creative community. If you're looking to grow your business, take a look at Pink Olive School... it might be just what you need to take the next big step! We're gearing up for the next Makers Summit, and look forward to hosting amazing industry experts like Grace Kang. What area of your creative business could you use the most help with? Are you looking to make the leap to a full-time career, interested in growing your online presence, or just want to know how to get started? Let us know what topics you'd like to see covered or speakers you'd love to hear, and mark your calendars for March 1, 2014! Sweet Paper Crafts: DIY Project and Party! We've got two wonderful treats to share, a project tutorial from Mollie Greene's new book Sweet Paper Crafts and a special party invite just for you! Sweet Paper Crafts, published by Chronicle Books, is a collection of 25 wonderful paper project tutorials. Mollie Greene has a fabulous knack for bringing life to bits of paper, whether through a dancing mobile or a celebratory garland flung over a doorway. These aren't your Aunt Edna's scrapbook projects, every one of Mollie's unique designs embodies her special flair for bringing life to bits of paper. Anyone can create paper art with these wonderful projects, from the eager beginner to experienced crafter. The simple, clear instructions and step-by-step photos in addition to the one-of-a-kind designs make this book a real treasure! Mollie Greene is our personal hometown hero, we at Indie Craft Parade are total groupies. She is an artist and writer living in in Greenville, SC with her 4 adorable children and talented photographer husband, J. Aaron Greene. Her handcrafted paper lovelies have been available at past Indie Craft Parade festivals, and can be purchased through her online shop, Royal Buffet. Mollie's papercrafts have been featured in numerous online and print publications, including Martha Stewart Weddings, Design*Sponge, and Southern Living. She self-published a wonderful papercraft book in 2011, Make & Do, and has just released a new collection of paper projects, Sweet Paper Crafts, published by Chronicle Books. We are so proud of Mollie and her continued success! She constantly inspires us with her fabulous style & aesthetic, her devotion to her family, her commitment to her work, and the incredible paper art she never fails to churn out. Mollie chronicles her everyday adventure on her blog, read along to join in the fun. Huge thanks to Chronicle Books and Mollie Greene for allowing us to share a project from Sweet Paper Crafts! This delightful garland is a quick and simple craft, perfect for a multitude of occasions. We love the whimsical look of stars punched from vintage magazines, but feel free to make it your own! Try parchment paper for a minimal, ethereal look, or swap out the star punch for a mini heart and craft a garland fit to make your lover swoon. If you have small scraps of paper just large enough to punch with tiny shapes, save them in a box for projects such as this garland. A star is just one of the cutouts you can use to make garlands to string from room to room and beyond. The sky is the limit when you consider all the punches available. Instructions: 1. With the scissors, cut thread to the length of the garland you want to make. If you are using fine thread, the garland should be no longer than 6 to 10 ft/5.5 to 9 m to prevent knots and tangles. You can make additional garlands, if needed, and hang them end to end. Tie a loop in one end of your thread. 2. Using the star-shaped punch, punch out a number of stars from your chosen papers, letting them fall into the bowl. 4. Beginning at the end of the thread with the loop, place the thread on the dot of glue on the star closest to you. Choose a star from the bowl and set it right-side up on the thread, aligning the points of the two stars. Repeat with the remaining stars in the row, spacing them as far apart or as close together as you’d like. Continue making rows of stars, dotting them with glue, and attaching the thread and the stars from the bowl until you reach the end of your garland. 5. Tie a loop at the other end of the thread and string your garland wherever you want to add a bit of whimsy. If you're in Greenville, you don't want to miss the official launch party for Sweet Paper Crafts. Everyone is invited to join the celebration! Mollie will be welcoming guests, signing books, displaying some of her latest paper crafts, eating cupcakes, and showing off her adorable baby. See above for all the details. There's a lot happening in The Village that night (First Fridays, food trucks, artist studios and galleries open), so drop by Mollie's party and then keep the fun going! Photos by J. Aaron Greene, used with permission from Chronicle Books. Furniture Makeovers Blog Tour and Giveaway! We're so excited to be the next stop on the Furniture Makovers blog tour. And we're particularly proud of the woman who made it possible---our hometown girl, Barb Blair of Knack Studios. Not only is Barb an indispensable part of the Greenville, SC arts community, but also she is a long time friend of Indie Craft Parade. Since our beginning Barb has served as both a board and jury member, lending her wisdom and advice. This past February Barb contributed to our very first Makers Summit by serving on a panel session giving advice to young businesses and creative startups. We can't say enough about how she's helped make our organization a success. What started as a kitchen cabinet makeover, slowly and organically grew into the full blown furniture design business that Knack is today. Barb has created a name for herself through her furniture makeovers with designs that are original, fresh, playful, and full of character. It's been five years since Barb started her endeavor as an entrepreneur, and now, she's launched a book---a great book! With gorgeous photos, thoughtful tutorials, before and afters, helpful resources, and tons of inspiration, this is one you need to add to your collection. The best part is that Barb has something in here for everyone. Whether you're a newbie, wanting to try your hand at repurposing furniture for the first time, or an old pro, looking to expand your style, Furniture Makeovers will help you create something beautiful. 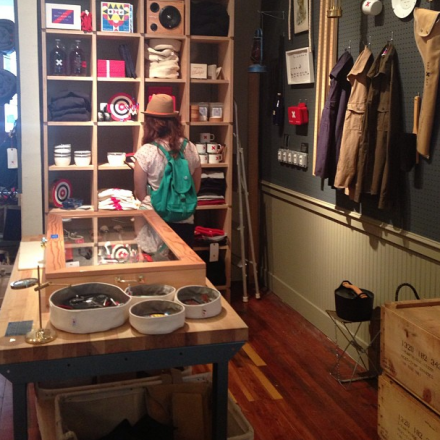 Next time you visit Greenville make a point to visit Barb's studio and retail space. Not only will you see her work for sale, but also you'll find paper, home, and kitchen goodies that you probably can't live without. Can't make it to her space? Check out Barb's online store. Now for the super exciting part...we're giving away a special book & tote set, thanks to Chronicle Books. You could be the lucky recipient of a signed copy of Furniture Makeovers and accompanying tote bag...yes you! All you have to do is check out Barb's online furniture store and tell us which piece is your favorite. Leave your thoughts in the comments below. The winner will be chosen at random and contacted on Wednesday, July 24. This giveaway will ship anywhere in the USA. Photos by Barb Blair and J. Aaron Greene, used with permission from Chronicle Books. As many of you know from our Facebook page or Instagram feeds, the staff at Indie Craft Parade took a brief hiatus last weekend to the big city. For a long time now we've been watching the success of long standing craft shows like Renegade Craft, so we decided to attend the fair hosted in Brooklyn. We're always fans of people or organizations who contribute to the modern craft scene, and we try to attend shows whenever possible. Our treks have been fairly local, however---Atlanta, Columbia, Asheville, etc.---so the prospect of attending a huge festival was quite exciting. Showing our excitement in the Renegade Photo Booth. So, with a date on the calendar we saved up our pennies, begged a couple days off work, kissed our husbands goodbye, and made the most of our time in New York. Although the trip centered on visiting the artists at Renegade, we did have a couple of days on either side of the festival...and did we ever fill them with the most wonderful things. Our game plan was to visit or learn about as many arts and craft locations as possible. We wanted to know how other people organize their festivals, storefronts, or studios with hopes of making our endeavors here in Greenville even better. We'd like to share with you a little bit about our trip---highlights of who we visited, what we saw, and how we're planning on making the Indie Craft Events better than ever! Day 1: We hit the ground running as soon as we landed. After checking into a cute apartment in Greenpoint Brooklyn, we headed to Manhattan to check out studios and supply stores. 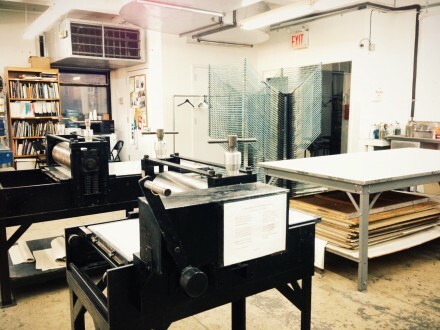 The highlight of the day, by far, was getting a tour of the Lower Eastside Printshop. This is a collaborative space where artists can either learn new mediums or rent studio equipment to further their own body of work. One of two giant communal studios. The printmaking equipment, particularly the screen printing setup is some of the best we've ever seen. Day 2: Renegade Craft Fair! In the very warm summer sun we perused 300 artists along with 20,000 other people for 6 very long hours. We took our time and saw EVERYTHING. We only stopped to cool ourselves with frozen treats and make new friends from the awesome website Kollabora. If you don't know this site, then you really should. It's a community based site that's meant to find or share crafting projects. Here you can post what you're working on, learn new skills that will make your projects easier, and connect with other makers you share your passion. It's a super great resource. Getting ready to enter the fair. A single row of tents. Checking out an embroidery artist. Day 3: We headed back to Manhattan. Since most offices and studios were closed for the weekend, we spent the day wandering the coolest shops in New York. Two of our favorite stops were Best Made Company and Purl Soho. Best Made...the home of wonderfully handcrafted or in-house designed goods for men...and where we picked up treats for the husbands. 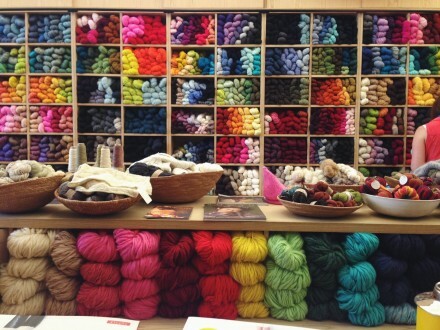 Purl Soho...yarn, felt, and fabric heaven. We found a Hugo lookalike project! Day 4: After finding a pie shop for breakfast (this was an amazing food trip, by the way), we headed to the corporate office of Etsy. We got a tour of the offices and Etsy Labs and were delighted to find that the Etsy office was basically one giant DIY project--everything from vertical pocket gardens to crocheted ventilation pipes to quilted room dividers and even a tech conference room that looks like a space station. 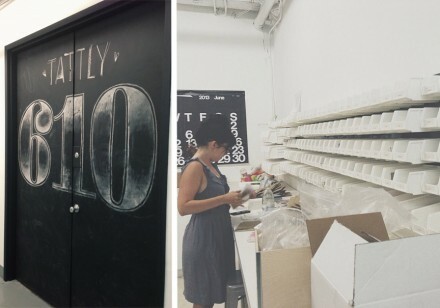 Our last big stop before heading home was at Tattly, an innovative company that produces design-y temporary tattoos. We had a great meeting with the staff, and we've got a fun collaboration coming up...details to follow. Well, that's a brief look at our trip. Thanks for joining us! We're back in Greenville and more excited than ever for the upcoming festival! All the applications are in, which means this weekend our jury has the heavy task of deciding who will be in the show. Check back in next week to see the vendors. We can guarantee you're going to be excited about who'll be there. It's time for another Etsy Global Craft Party, this time hosted by our local South Carolina Etsy Team! If you aren't familiar with the Global Craft Party idea, the goal is to get people around the world making things 'together'. This year's party is happening next week, on June 20, from 6-8pm. Etsy explains the idea for us: In a nutshell, Craft Party is a celebration of meeting and making, of creativity and community. It’s a time to meet your neighbors and share a creative skill. It’s a time to have fun and party down with your favorite craft supply in hand. 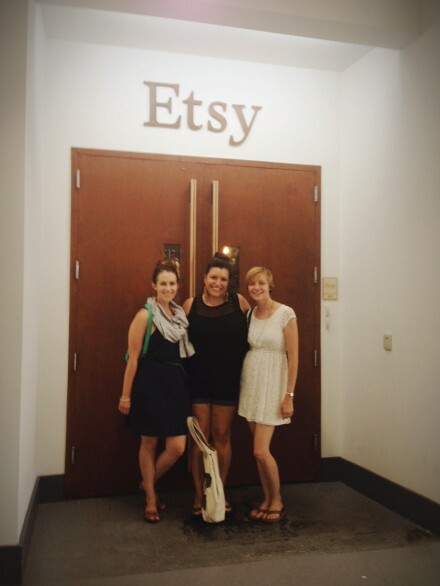 Our local Etsy Team will be hosting next week's party, and if you have an Etsy shop or are thinking about setting one up, you'll want to meet the ladies behind the team! Not only can they answer your Etsy questions, they regularly post helpful resources and links in the Etsy Discussion Forums, so be sure to check them out. They describe the Greenville Etsy Craft Party as: a casual get-together where you can bring your own craft(s) to work on with other local crafty peeps! We'll also have a craft supply swap (bring some supplies to trade/leave in order to take some new ones home) and shop critiques at the Greenville event! Date: June 20, 2013 Time: 6-8 pm Place: Oriskany Glass Studio, 1112 Rutherford Rd Bring: your own craft to work on, craft supplies for trading RSVP here. The good news is that even if you're not in the area, chances are there's still an Etsy Craft Party near you. Visit the Craft Party site to find your local party!